Cologne - It was not just in Germany that the Bundesliga’s 93rd edition of Der Klassiker had fans gripped. Spectators the world over could not take their eyes off the screen as FC Bayern München recorded a ruthlessly efficient 5-1 win over Borussia Dortmund. And while the contest itself was rather one-sided, German football’s great modern rivalry remains as appealing and relevant as ever. Even in the build-up to the hottest fixture on the Bundesliga calendar, fans from Asia, the Americas, Africa, Australasia and Europe were inundating the Bundesliga’s official English-language Twitter channel with Klassiker-themed selfies and predictions for the big game. FC Bayern’s and BVB’s official Twitter accounts also had their fingers right on the button before, during and after the match. Be it text updates, snaps of the team buses, Vines from inside the stadium or post-match reactions from the players, the two clubs ensured no one missed out on the action. Naturally, the fans’ response was overwhelming. With Bayern and Dortmund boasting some of the most exciting talent in world football, it is easy to see why Der Klassiker garners such widespread interest. As many as 15 different nationalities were represented in the combined matchday squads, in a game that also saw two of the game’s most innovative head coaches, Pep Guardiola and Thomas Tuchel, lock wits. 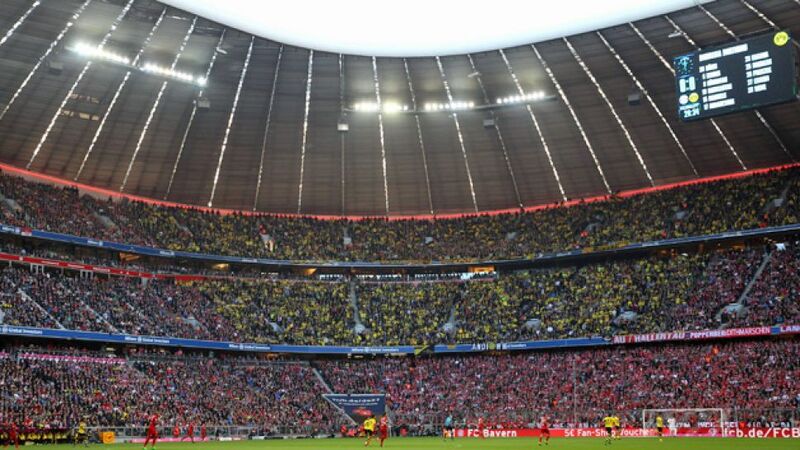 A vociferous 75,000-strong crowd packed out the Allianz Arena, while millions assembled at home to savour a veritable football feast, and the 2015/16 Bundesliga season’s top two and most free-scoring ensembles went at it like only they know how. Both sides hit the mark with over 80 per cent of their attempted passes, registered double figures when it came to shots on goal and, of course, continued their impressive runs of scoring in every match so far this term. In the end it was the defending champions that made pretenders out of BVB’s 'contenders' tag, with megastar trio Thomas Müller, Robert Lewandowski and Mario Götze grabbing the goals and setting a whole host of records in the process. Dortmund’s fleeting response came by way of Pierre-Emerick Aubameyang’s 10th strike of the campaign, the Gabon favourite nevertheless extending his own rather special Bundesliga scoring streak to ten consecutive matches stretching back to last season. For the Dortmund faithful, it was a reminder of how far they have come since 2014/15’s disappointing seventh-placed finish, but also of the level they still need to reach if they are to challenge the defending champions for honours. Fans of a Bayern persuasion, meanwhile, returned home having just witnessed another sensational show of attacking might. Round two on Matchday 25 cannot come soon enough.